Like virtually every other American I've spoken with, I'm disgusted by my elected officials who seem incapable of doing the job they are paid to do, and each day of the government shutdown makes me angrier. Unlike many of the people I've talked to about this, though, I don't think that it's a matter of "both" sides finding a way to "negotiate." For one, I know that the "both" sides is an illusion. This isn't a coin to flip. Depending on how you want to slice and dice, there could be as few as one side or as many as 535 (536 if you want to count Obama's, too). After all, several Republicans have publicly asked for passing a clean continuing resolution and ending the shutdown. What "side" are they on if there are only two? Our tendency to boil everything down to two sides is indicative of our rhetorical desire for an antagonistic battle to the end. 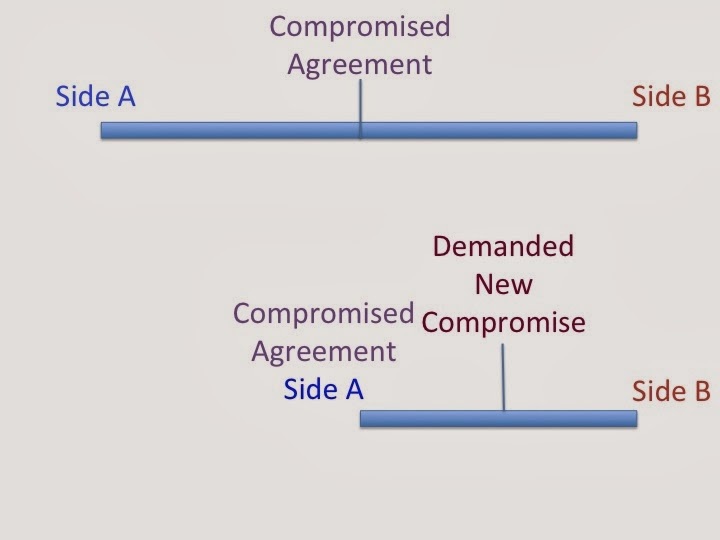 We have two sides, each representing an extreme of some kind, and we force them to "negotiate" where either one side will "win" or the two sides will each move to the "middle" and we'll get the best solution. In a recent speech, Obama came out swinging against this media narrative, reminding us that Democrats already negotiated; the funding levels a clean CR would put into place are already a compromise where the Democrats agreed to meet Republican demands on funding, cutting the funding for many programs they see as key. Yesterday, Republican Congressman Brad Wenstrup went on the House floor to request that everyone stop throwing around war metaphors for this current conflict, but war metaphors are the natural landing place for a culture that only knows antagonistic rhetoric when there is a conflict. We give lip service to collaborative styles of rhetoric, but (on a mainstream scale) we don't even have the language to talk about what we're currently facing: a conflict that is not a war. The liberal model of rhetoric (and here liberal has nothing to do with the political label) is designed to allow room for debate from all involved parties. It is meant to erase the power differentials and bring everyone's best ideas into an open forum where they can be heard with rationality and balance. We can then let the best idea "win." This concept sounds so good that we continue to insist on it no matter the circumstances. I've heard a lot of people angrily insisting that our politicians use the liberal model to handle this current conflict. "Just sit down at the table and listen to one another," they say, and it's easy to see why this model is appealing: it seems rational, balanced, and fair. It seems like the polar opposite of what is currently happening. It seems like progress. social choices are made by rational debate, in which all have equal voice; choice is determined by cooperative action of the participants. Power is played down. Eliminating the power differential can be a good thing. When a peasant's voice is given the same weight in a debate as a lord's, we end up with fairer policies. When people can't be dismissed because of their race, gender, sexual orientation, or economic status, we hear more diverse and worthwhile ideas. Democrats have more power in this situation not because they're being unfair but because we voted to give them that power. The refusal of Obama and the Senate to negotiate on the shutdown is not a "war" on a weaker idea; it is a reflection of the democratic process in action. Furthermore, this is not really a case of a slim majority of Democrats trying to overpower a slightly smaller group of Republicans. Many Republicans (including, it is rumored, John Boehner himself) want to vote for a clean continuing resolution and move on. The conflict is being continued because we are operating as if 18% of the elected officials in one half of one third of the federal government should have equal power as the rest of their branch of government and another entire branch of government combined, which is not reasonable or rational. Liberal rhetorical policy teaches us that all voices hold equal weight, but that is directly counter to what it means to have a representative government. We hold an election and require those representatives to vote on things because those numbers matter. No one suggested, or even mentioned, troop withdrawal, or reduction of the far more devastating bombing of South Vietnam; on the other extreme, no one talked of nuclear arms, and only the generals mentioned invading North Vietnam. The assignment not only excludes 'philosophy,' it excludes all tactics but those most like present tactics. The liberal model of rhetoric tells us that extremes are bad for the very simple reason that they are extremes. It has nothing to do with examining the actual content of those arguments: extreme positions are bad positions; the middle ground is always the best. That's the rhetoric that's surrounding the current political turmoil. "Why can't these two sides sit down and come to an agreement," we ask. But these "two" sides have already negotiated. By positioning themselves as a new extreme, the Tea Party members of the Republican party have been able to use our desire for reasonableness and moderation against us. They have now taken the moderate position that was already negotiated and positioned it as a new extreme, asking us to meet in the middle again. But that middle is not a "middle" at all. By failing to move with the previous compromise and positioning the already compromised agreement as a new "extreme," a slim minority of the federal government representatives have given the impression that the only reasonable act is to continue acquiescing to their every whim. This is not reasonable or rational, and it is a deliberate ploy to play upon our desires for reasonableness and rationality to manipulate the system. A handful of Republican officials are trying to trick America into thinking that they are half of a two-sided debate, but neither their number nor their position is accurate. This is not about moving to the middle; it is about government representing the majority, not the most vocal and least flexible. This is brilliant. Can we get you on some of those news shows?? "The Democrats have more power because they won more votes in the election." But this also the problem. We have three branches of government and two parties so they can keep each other in check (cue the "Three Ring Circus" song from Schoolhouse Rock). If we have a democratic president, democratic congress, and democratic judiciary, then the system isn't working. I agree with everything that you said, and I don't think the Dems should compromise and that the actions of the Republicans/Tea Partiers for the last several years has been appalling, but if the only way for things to get done is to have a one-party system, then Americans are losing on a whole nother level. I am a CSPAN junky but the last few days have been just one long talking point mobius strip of floor speeches with little to no purpose other than making sure every Rep got on record (every Rep but mine it seems--and he's no longer answering my emails). No one on that house floor is actually having genuine debate. The rhetoric is thick and the logic murky at best. This morning the House passed a resolution to reinstate funding to allow civilian chaplains to go back to their duties on military bases. We've got money for faith but you're going to have to go to the ER for that earache...I'll stop now as I feel myself morphing into a rant. Great post. While considering that we "voted to give them the power" keep in mind that the republicans in the house were also duly elected and further as representatives in the house are apportioned by population they more clearly reflect a majority of the population than do senators who are apportioned by 2's subject to equally arbitrary historical borders. The house has passed numerous bills which would allow the government to operate, the senate has not even voted on a single one. Obama has said he would veto any bills that tried to piecemeal restart the government. I honestly have no idea how this shutdown falls on the heads on the republicans. The democrats are at the very least equally guilty. Myself, I disagree that the republicans have failed to do their job. I am in favor of smaller government that was reflected in my votes for representation. If the plan is to expand government and republicans feel their job is to stop the expansion, then they have no other choice. I don't fault the democrats for attempting to expand the government, that's their belief. Similarly I don't believe democrats should fault the republicans for attempting to contain the government. I'm certain that common ground exists but to this point, the president and the democrats in the senate have said they aren't willing to negotiate. And use words like hostage taking and negotiating at the point of a gun. This president does not know how to lead. He knows how to divide not unite. Leadership is being willing to negotiate not saying it's my way or the highway. I'm fairly certain this won't be a well received comment but I felt it needed to be made, else we risk falling into confirmation bias. The house republicans are guilty of voting in line with their beliefs, the senate democrats in line with theirs but in terms of who's represented by whom, let's be clear, the majority of the population of the country is represented by republicans because they received more votes. WE voted to give them power. I'm sorry for all that, I just couldn't keep it in. Trust me. I have no risk of falling into confirmation bias. I live in a red state surrounded by people who disagree with me. They use many of the same factually inaccurate statements you're making here (I'll get to that in a moment.) In addition, I actively seek out the published viewpoints of those who see this differently than I do. I consider them, and sometimes they change my view. I disagree with your idea that the goal of elected officials is to do "everything in their power" to represent the viewpoints of their constituents if that includes shutting down the government. They are just that: representatives. They go to the floor, vote as their constituents demand, and then we move on. I certainly didn't agree with much of what happened under the Bush presidency, but I didn't want the people representing my view to shut down the government over it. That's a matter of opinion, though. What is not a matter of opinion is your absolute mathematical and statistical falsity in saying that "the majority of the population of the country is represented by republicans because they received more votes." You are wrong. These are numbers, and you are wrong. Democrats received 54,301,095 House votes. Republicans received 53,822,442 House votes. Surely, no matter how much you disagree with me, you can see that 54,301,095 is more than 53,822,442, right? I mean, that's math. in several continuing resolutions leading up to sequestration, in which spending was cut commensurate with Republican demands, and sequestration itself is a form of compromise where the overall size of the government was reduced, again in line with the stated goals of the Republican party. in their power to get their way. In general keeping the government operational is more important than individual legislative items, and while you may be able to argue certain exceptions, delaying the ACA isn’t one of them. Correct 54,301,095 is more than 53,822,442 by almost 500,000. However, I wasn't saying votes, I was saying number of people represented. More people are represented by republicans than by democrats. And representation in the house is based on population. Total votes wasn't the number I was pondering, I was pondering number of house representatives. I'm aware how math works. Well, I am sure you can see how I could have misunderstood your intent since you said "they received more votes," which I (crazy I guess) took to mean you were saying they received more votes. A statement that is absolutely false. You know you're really pretty condescending for supposedly being open to other views. My comment was fairly clearly related to representative districts in which Republicans clearly received more votes in order to be elected as representatives. Aggregating votes across district lines is using false logic to prove your point. Why would you aggregate total votes across district lines? The result is meaningless. Yes it's more total votes but it ignores any factors that would change if somehow total nationwide votes counted in house races. Total nationwide votes have no bearing on the outcome of local races. Unless the process is changed and if it were changed I'm sure it would be a prospective change rather than a retrospective one. But yes, total nationwide number of votes cast may have been more democrat. Though in 100 million votes I'd hardly call less than 500k a landslide. Maybe the real question is how to increase voter turnout overall? That last one was a little condescending, and I am sorry. The reason I think it is so important to make sure we get these numbers and facts right is that Democrats received more votes for the Presidency, in the Senate, and in the House. They have more power because we have a representative democracy and we voted to give them more power. The American people voted for the Affordable Care Act. It passed through our government processes. The small minority of (mainly Tea Party) Republicans can't seem to understand that their views are not the majority, perhaps because this is one of the first times in their lives the country as a whole has not reflected the little bubble of reality in which they are living. In the article I linked above about the percentages, it explains that while the country became more racially diverse, more urban, and more Democrat, the districts these (almost entirely) men represent became whiter, more rural, and more Republican. They may represent their constituents, and I don't fault them for doing that, but their constituents are the minority, and shutting down the government because you didn't get the votes to get your way is not democracy, it's a temper tantrum. Yeah, I suppose that a minute funding bill in comparison with an absolutely enormous bill is the same thing. informal admissions process begins the day you step foot in college!